The building in the postcard shows the famous "Dominant Store of the Ozark Empire," as Heer's was known. The postcard is postmarked April 7, 1917, so the photograph was taken circa 1917. It depicts a very busy day on the Springfield Public Square with lots of pedestrians, automobiles and a trolley. The large seven-story Heer's Department Store building sits at the northwest corner of the Square. The building was composed of steel and terra cotta reinforced with concrete, with 100,000 square feet of floor space. It was extremely well-constructed with regard to fireproofing for the very good reason that the previous Heer's location -- along with a block of the Public Square -- was completely destroyed by a fire which began in the Heer's store. 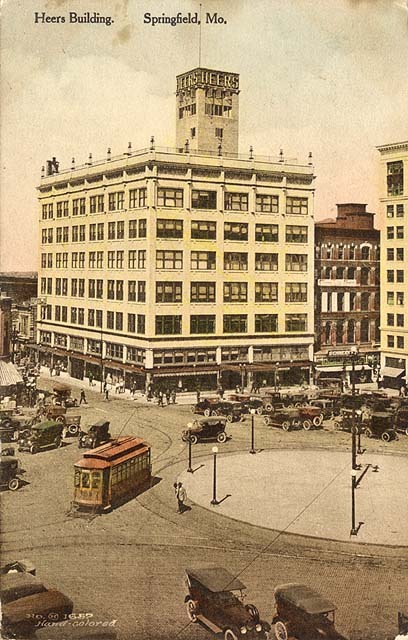 Besides regular department store amenities, the building contained an auditorium open to the public for free use and a roof-top garden or "garden in the air." The store hosted an admiring throng of 21,000 during the formal opening in September 1915. Heer's began when Charles H. Heer opened a 20- by 100- foot store right off the Public Square on Boonville Hill near the southwest corner of Boonville and Olive in 1869. In the following ten years, two more floors were added to the original building and the store was incorporated as the Charles H. Heer Dry Goods Co., the second business in the state of Missouri to be incorporated. Starting in 1890 and until 1940, Heer's son, F.X. Heer, managed the store and made some major changes such as eliminating the barter system and setting one price on merchandise. He also moved the store to the site of the former Electric Theater after it was demolished in 1903. 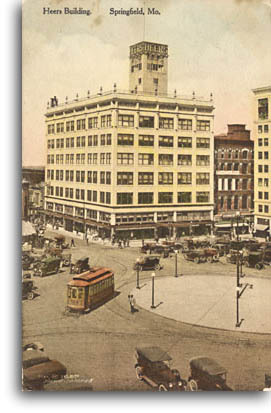 In June 1913 a large fire destroyed the nearly new Heer's Store as well as most of the northeast section of the Public Square. For two years Heer's operated out of the recently constructed Holland Building on St. Louis Street. During this time the old courthouse was demolished and the new Heer's rose in its place. The building was completed in 1915. The tower at the top of the building contained an observatory where the public could use built-in binoculars to see far points in all directions. It was claimed that the building was situated so that it was the highest point between Denver and the Alleghanies. This made it a logical place for a radio station. It was also used by the police department to transmit and receive "radiophone" signals during the 1920s. During the 1920s Heer's had excellent business and even branched out into furniture sales at a separate location. The 1930s brought the expected downturn and the furniture division was eventually shut down. The 1940s and 50s were periods of growth. In 1940 Heer's was bought by Allied Stores of New York. In 1951 a major renovation of the store was completed, including the addition of air conditioning and escalators and an expansion of the store to where the Baker Building previously stood. In 1960 Heer's followed the examples of Springfield schools and colleges by making their building open to persons of all races. In 1969 F.W. McClerkin, the president of Heer's announced plans for a major renovation of Heer's exterior to make it more closely resemble new department stores in the major cities. The work was completed in December 1969, which coincided with Heer's centennial celebration. The building now had rows of structural glass in a golden bronze color. White arches rose to the full height of the building. While this was thought to give the store a modern and competitive look, it significantly altered the historic character of the building. In 1976 Heer's opened a new store in the Battlefield Mall. Both it and the original Heer's were sold in 1987. During 1990 owners of both stores filed for bankruptcy. By 1995 the Heer's store was closed for business. Davis Properties added Heer's to their holdings in July of 1995. The state of Missouri considered buying the buiding to use as a state office building in 1996, but decided it was not feasible. By 1998 the empty building had become hazardous, with large glass panels tumbling onto the street below and causing damage on two occasions. The Compass Institute attempted to purchase the building in 1998 for use as a "social complex." Davis Properties is currently planning to renovate the building with offices and a restaurant.